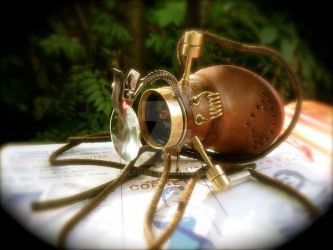 I am a student filmmaker from Germany planning a steampunk influenced 45min film adaptation of a classic german horror novel, for which I would LOVE to use one of your Mono-Goggles!! Can we get in contact? The film will be shot in october 2010. The German Steampunk community will report on the project and it will probably be screened in German Television. I love your works as much I love the Victorian steampunk feel. Keep conjuring up on those fantastic creations. I have featured you in my news article Full Steam Ahead!. Please the article if you like it so that more people will see this wonderful art made by you and the other artists. You are awesome - love your work! Your goggles are absolutely gorgeous! I notice you haven't posted anything in a long time; are you still making them? About how much do you charge? I am utterly fascinated by your work.